Many children will return to school after the Easter break to find their schools have been turned into Conservative party indoctrination camps, financed by corporations owned by hedge funds and run by some city type with the morals of a particularly cunty weasel. 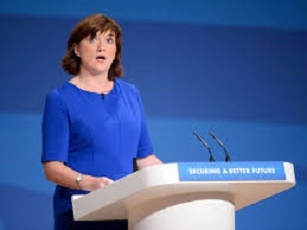 Education secretary Nicky Morgan said that the retraining and moral adjustment of teachers should be a formality as many would simply be required to read pupils the Daily Mail and subsequently grade them according to their levels of indignation. “If I have ten apples and I give 2 to a friend of mine that owns a bank then we still have ten because we will take them from poor and disabled people. Unless they don’t have two apples in the first place in which case they must be punished for mucking up our maths.” She told a delegation of teachers yesterday. Indeed, OFSTED inspections are thought likely to focus on such key performance indicators such as as blind uncompromising sheep like adherence to right wing views, independent from constraints such as freedom of thought. Prime Minister David Cameron has hailed the move as a victory for common sense. “It’s cut the red tape and left teachers free to do exactly what we tell them. And now finally schools can get on with the job in hand. Making money for our toady little friends.” He explained. I thought this was supposedly a satirical website. If I want straightforward reportage like this I read the Guardian.